This medication is used to prevent or treat gout attacks (flares). Usually gout symptoms develop suddenly and involve only one or a few joints. The big toe, knee, or ankle joints are most often affected. Gout is caused by too much uric acid in the blood. When uric acid levels in the blood are too high, the uric acid may form hard crystals in your joints. Colchicine works by decreasing swelling and lessening the build up of uric acid crystals that cause pain in the affected joint(s). This medication is also used to prevent attacks of pain in the abdomen, chest, or joints caused by a certain inherited disease (familial Mediterranean fever). It is thought to work by decreasing your body's production of a certain protein (amyloid A) that builds up in people with familial Mediterranean fever. Colchicine is not a pain medication and should not be used to relieve other causes of pain. Read the Medication Guide provided by your pharmacist before you start taking colchicine and each time you get a refill. If you have any questions regarding the information, ask your doctor or pharmacist. Take this medication by mouth with or without food, exactly as directed by your doctor. Dosing recommendations vary widely and may be different from the following recommendations. Taking more than the recommended dose may not increase this drug's effectiveness and may increase your risk for side effects. Ask your doctor or pharmacist for more details. If you are taking this medication to treat a gout attack, carefully follow the directions given by your doctor. This medication works best if you take it at the first sign of an attack. The recommended dose is 1.2 milligrams at the first sign of an attack, followed by 0.6 milligrams one hour later. The maximum recommended dose is 1.8 milligrams taken over a 1-hour period. Ask your doctor ahead of time about how soon you can repeat treatment with this medication if you have another gout attack. If you are taking this medication to prevent gout attacks or for pericarditis, ask your doctor about the dose and schedule you should follow. Carefully follow your doctor's directions. If you are taking this medication to prevent attacks of pain caused by familial Mediterranean fever, the usual dose is 1.2 to 2.4 milligrams daily. The total dose may be taken once daily or divided into two doses a day. Your doctor may need to adjust your dose to control your symptoms or if you have side effects. The dosage is based on your medical condition, other drugs/foods you may be taking, and response to treatment. To reduce your risk for serious side effects, do not increase your dose, take it more frequently, or take it for a longer time than directed by your doctor. Serious side effects may occur even at usual prescribed doses. If your doctor directs you to take colchicine regularly, use it regularly to get the most benefit from it. To help you remember, take it at the same time(s) each day. Diarrhea, nausea, cramping, abdominal pain, and vomiting may occur. If any of these effects persist or worsen, tell your doctor or pharmacist promptly. Stop taking this medication and get medical help right away if any of these very serious side effects occur: unusual bleeding/bruising, severe diarrhea or vomiting, muscle weakness or pain, numbness/tingling in your fingers or toes, pale or gray color of the lips/tongue/palms of hands, signs of infection (such as fever, persistent sore throat), unusual weakness/tiredness, fast heartbeat, shortness of breath, signs of kidney problems (such as change in the amount of urine). List Colchicine side effects by likelihood and severity. Before using this medication, tell your doctor or pharmacist your medical history, especially of: kidney problems, liver problems (such as cirrhosis). Alcohol can decrease this drug's effectiveness. Limit alcohol while taking this drug. This medication can affect how well your body absorbs some foods and nutrients (such as vitamin B12). Consult your doctor or pharmacist for more details. Older adults may be more sensitive to the side effects of this drug, especially muscle weakness/pain and numbness/tingling in their fingers or toes. Colchicine can decrease sperm production, which may affect the ability of a male to father a child. Consult your doctor for more information. This medication passes into breast milk. While there have been no reports of harm to nursing infants, consult your doctor before breast-feeding. Your doctor may recommend that you separate the time(s) you take your medication apart from breast-feeding. What should I know regarding pregnancy, nursing and administering Colchicine to children or the elderly? Other medications can affect the removal of colchicine from your body, which may affect how colchicine works or increase the risk of serious side effects. Examples include certain azole antifungals (such as itraconazole, ketoconazole), HIV medications (such as ritonavir), macrolide antibiotics (such as clarithromycin, erythromycin), telithromycin, verapamil, among others. Colchicine may rarely cause a certain serious (even fatal) muscle damage (rhabdomyolysis). This muscle damage releases substances that can lead to serious kidney problems. The risk may be increased if other drugs that may also cause rhabdomyolysis are taken along with colchicine. Some affected drugs include: atorvastatin, digoxin, gemfibrozil, pravastatin, simvastatin, among others. Does Colchicine interact with other medications? Should I avoid certain foods while taking Colchicine? If someone has overdosed and has serious symptoms such as passing out or trouble breathing, call 911. Otherwise, call a poison control center right away. US residents can call their local poison control center at 1-800-222-1222. Canada residents can call a provincial poison control center. Symptoms of overdose may include: severe nausea/vomiting/diarrhea, abdominal pain, trouble breathing, weakness. Being overweight, drinking too much alcohol, and eating certain foods may worsen gout symptoms. Limit alcohol and ask your doctor, pharmacist, or dietitian about avoiding foods high in purines that may worsen gout (such as anchovies, bacon, beer, sardines, organ meats including liver/kidneys). Laboratory and/or medical tests (such as blood tests, kidney function, liver function) may be performed periodically to monitor your progress or check for side effects. Consult your doctor for more details. If you are taking colchicine regularly and miss a dose, take it as soon as you remember. If it is near the time of the next dose, skip the missed dose and resume your usual dosing schedule. Do not double the dose to catch up. 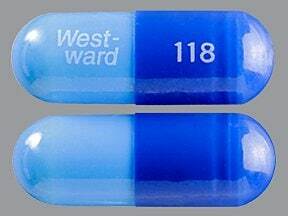 This medicine is a dark blue light blue, oblong, capsule imprinted with "West- ward" and "118". 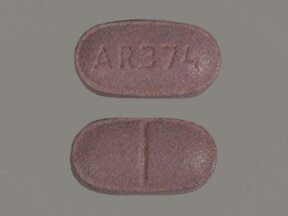 This medicine is a purple, oblong, scored, film-coated, tablet imprinted with "AR 374". Are you considering switching to Colchicine? How long have you been taking Colchicine?